Today we've got the HC-ranked USA Pro Cycling Challenge, which runs through the 23rd. Update: Because Giampaolo Caruso's EPO positive was from a retested 2012 sample, it will not trigger the two-positives-in-one-season team suspension rule that took affect in 2015. Caruso's Katusha team will be allowed to start the Vuelta. Original story: Katusha rider Giampaolo Caruso has been provisionally suspended after a a 2012 sample was retested and found to have traces of the banned blood booster EPO. The statement from the UCI said, "The UCI announces that it has notified Italian rider Giampaolo Caruso of an Adverse Analytical Finding of Erythropoietin (EPO) in a sample collected during an out-of-competition test on March 27, 2012. The sample had been stored and was re-analysed in light of new scientific developments." Caruso does have the right to have the "B" sample analyzed. He was on Katusha's roster to ride the Vuelta a España, but that ride isn't happening, certainly. The fact that Caruso is the second Katusha rider to return a banned drug positive this year (Luca Paolini was positive for cocaine during the Tour de France) makes it possible that the entire Katusha team will be suspended for anywhere from 15 to 45 days. That happened to Androni Giocatolli, which is currently watching bike racing on TV. If that happens, Katusha riders will most likely not start the Vuelta. The Union Cycliste Internationale (UCI) announces that it has notified Italian rider Giampaolo Caruso of an Adverse Analytical Finding of Erythropoietin (EPO) in a sample collected during an out-of-competition test on 27 March 2012. The sample had been stored and was reanalysed in light of new scientific developments (*). (*) As per the World Anti-Doping Code and the UCI ADR, the UCI has established a Storage and Reanalysis Strategy. The strategy, implemented by the Cycling Anti-Doping Foundation (CADF), provides that samples from the leaders of the Grand Tours, UCI World Championships and general rankings of all cycling disciplines will be stored for potential retesting. Other samples, based on risk assessment carried out by the CADF, laboratory recommendations, Athlete Biological Passport data, new detection methods and scientific developments, will also be retained for retesting. The standard time of storage and further reanalysis under this strategy is up to 10 years. 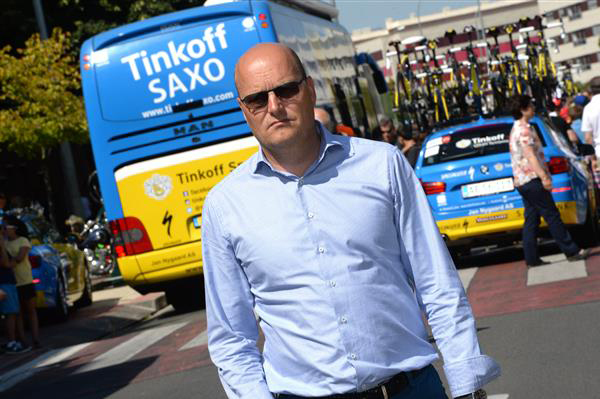 After splitting with Tinkoff-Saxo in March, Bjarne Riis has been hungering to return to pro racing management. He has a close relationship with Saxo Bank boss Lars Seier Christiansen and reportedly can bring 5.25 million USD (4.725 million Euros) of the bank's money to any team Riis can manage. Reportedly Riis has been turned down by MTB-Qhubeka and Trek Factory Racing. Rather than scratch-build a new team, Riis wants to manage an existing team, but his troubled doping history and that of some riders on teams he has managed seems to be getting in the way of Riis' finding a team to run. Arapahoe Basin, Colorado - BMC Racing Team's Brent Bookwalter soloed to win Tuesday's mountain-top finish at the USA Pro Challenge and teammate Rohan Dennis was runner-up as Bookwalter replaced teammate Taylor Phinney as the race's overall leader. Bookwalter, who won for the first time since February of 2013, said he did not immediately realize he was the winner of the 185.5-kilometer race that finished at the Arapahoe Basin ski resort. "The last time board we saw was to (breakaway rider) Nate Brown - and was a minute, I think, with over a kilometer to go, maybe a kilometer-and-a-half," Bookwalter said. "Rohan had me cross-eyed, just biting my stem the whole time. I wasn't really aware of when Nate came back or who was going on. I was just concentrated on doing the best climb I could and holding Rohan's wheel. Then, with about 500 meters to go, I actually caught my breath and felt recovered. I chucked it in the big ring and gave it everything I had. Obviously I was going for seconds also, so there was no time to celebrate. It is a good feeling." Bookwalter credited his teammates for first helping bring back a 12-man breakaway and then for setting a hard tempo that reduced the front group to fewer than 10 inside of five kilometers to go. "These guys were riding like machines all day," he said. "They were incredible. I had to keep telling them to slow down and not bring the break back too quickly. They were hurting me when they were surging over the climbs. I didn't really feel great all day, but I think a little bit of that was the attitude. It was actually nice to get to that last climb and have Rohan put the hammer down. Then it was simple: hold the wheel, ride as hard as we can and it's done. There is no more conserving at that point." Dennis said he was surprised by his runner-up performance, his fourth on the year. "I saw on the TV screen that Brent was sort of next to me, so I tried to get on him," he said. "But he went straight past me and got into position to win. It is great we went 1-2, and I sort of surprised myself. I rode pretty well from the bottom to the top, and I was expecting to blow with at least three kilometers to go when people started attacking." Bookwalter won the BMC Racing Team's 27th race of the year and its fifth since Saturday. Ben Hermans and Silvan Dillier won Stages 3 and 4, respectively, of the Arctic Race of Norway on Saturday and Sunday while Manuel Quinziato won the last stage of the Eneco Tour, also on Sunday. On Monday, Phinney won for the first time since making his comeback earlier this month at the Larry H. Miller Tour of Utah after being sidelined by injury for 62 weeks. In the overall standings, Bookwalter leads Dennis by six seconds. Jonathan Clarke (UnitedHealthcare Pro Cycling Team) is third and Hugh Carthy (Caja Rural-Seguros RGA) - who finished third on the stage - is fourth. Both are 10 seconds off the lead. 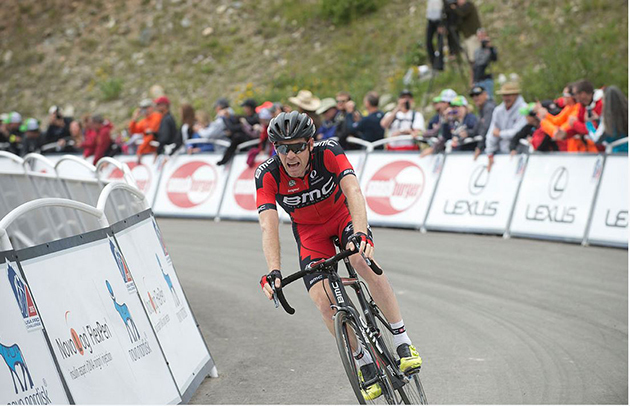 Phinney kept his lead in the sprint classification while the BMC Racing Team remained leaders in the team standings. Sport Director Jackson Stewart, who raced with Bookwalter on the BMC Racing Team from 2008 until his retirement in 2010, said he cannot recall seeing the Asheville, North Carolina, resident winning a bigger race. "Brent has always been the guy who led out our other guys to get there," Stewart said. "For me, he deserves so many more results than he ever got. He was so close to being national road champion and national time trial champion in the same year. Little things like that where he has been so close in results before. And that was in the few times he was able to try for himself. Most of the time, he was working for others. So to win a race like this and take the jersey like this is huge for him and his career. It is a big payoff for all the work he has done in the past." Tinkoff-Saxo has selected the nine riders that will represent the team at this year’s daunting Vuelta a España, where both rivals and terrain represent the hardest edition in years. Rafal Majka will captain the team gunning for a top spot in the general classification against big GC stars, while Peter Sagan is set to tackle the fight for stage wins. Tinkoff-Saxo sends team captain Rafal Majka, Peter Sagan, Pavel Brutt, Jesper Hansen, Daniele Bennati, Maciej Bodnar, Sergio Paulinho, Pawel Poljanski and Jay McCarthy into action at Vuelta a España 2015, where the team lines up as defending champions. “Here, before the start of the Vuelta, our goal is to win a stage with Majka and secure a good final position in the general classification with him. 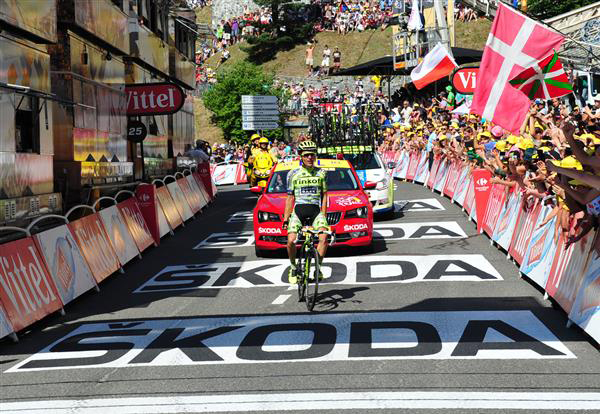 Majka is our clear GC captain and he will be up against most of the big stars such as Froome, Quintana and Nibali. At the same time, we’ll support Sagan, who’s feeling ready after a post-Tour recovery period. He will be targeting the flat and hilly stages, while Rafal will have the backing of the entire team in the mountains”, says Tristan Hoffman, leading sports director at La Vuelta. 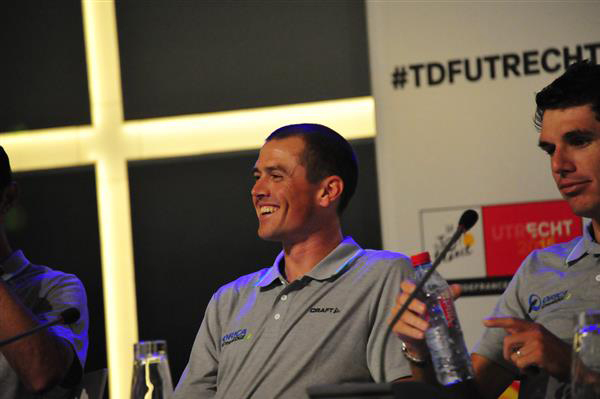 “With riders like Majka and Sagan we must have ambitions. They both had a really big peak in condition during the Tour, especially Peter, so we will have to see, where they stand as we get underway. Hansen, Paulinho, Poljanski and McCarthy will be important helpers for Rafal in the mountains, while we will be able to set up a strong sprint train and lead-out for Peter with guys like Bennati, Bodnar and Brutt”, adds Hoffman. Vuelta a España commences Saturday, August 22 with an intensive TTT to Marbella immediately followed by undulating and mountainous stages that practically continue until the grand finale in Madrid after one of the toughest Vuelta routes seen in years. Rafal Majka, acclaimed climber, will take up the GC reins for Tinkoff-Saxo and notes that he enters the race with motivation. “I start and face this Vuelta a España with great enthusiasm. I’ve recovered well, both physically and mentally, which is also very important before a race this long, hard and far into the season. I have prepared well at altitude and I will soon know how my shape is exactly, as this Vuelta definitely doesn’t have an easy start. I’m happy to lead Tinkoff-Saxo at this Vuelta, I believe that we have a competitive squad and personally I’m very motivated”, comments Rafal Majka, while teammate Peter Sagan notes that he’s excited to see how the legs respond after a period of rest. “After a tough and demanding Tour de France, I had a good period of rest and I prepared myself in order to give my best at the Vuelta a España. I will assess my shape during the race. It will, undoubtedly, be a hard and challenging Vuelta and I look forward to going back to racing with my team”. Vuelta a España will challenge the riders with no less than nine mountain top finishes concentrated in the first two weeks. Tristan Hoffman underlines that, although none of the 2015 Vuelta’s summit finishes have ever previously been faced, the three weeks of racing will undoubtedly feature large doses of demanding climbing. “On the hilly and flat stages, we’ll be there for Sagan. Earlier this year, him and Bennati showed that they were able to set up successful sprints together. Furthermore, it will be difficult to control this race, so several of our guys might seek the breakaways to actively search for the openings. No matter what, we bring a group of guys that want to fight and we’ll see how the race progress day by day”. “We would like to get Esteban in the top ten on the general classification. When you look at the line up for the Tour of Spain there are some really good bike riders and to run top ten here would be something pretty huge. We also want to pull off a stage win and if we can pull off one, why not two? 2014 Tour of California and Tour de Suisse stage winner Chaves enters the Vuelta a Espana after a stint at altitude in Colombia. The 25-year-old was ORICA-GreenEDGE’s first general classification consideration at last year’s edition and returns in 2015 after twelve months of further development, including this year’s Giro d’Italia. “We have a bit of a mixture of guys in here,” Stephens said. “The good thing about this Tour of Spain team is that we have some designated workers. Mat Hayman is famous for the work he can do for someone like Caleb Ewan but what people don’t see in the enormous amount of work that he can do for someone like Esteban Chaves. 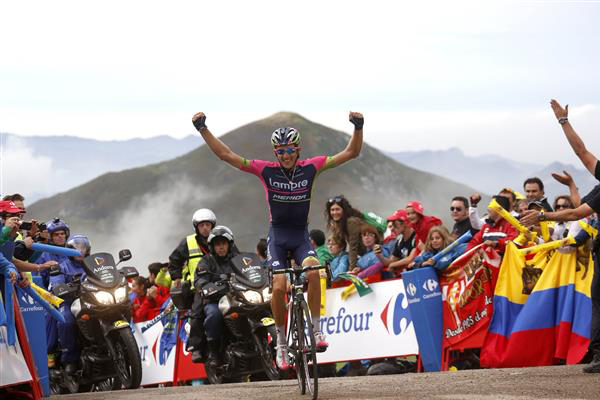 The technical staff of Team Lampre-Merida selected 9 cyclists who’ll participate in the 2015 edition of the Vuelta a Espana (22 August-13 September). Mattia Cattaneo: 24 years old, Italy, first appearance the Vuelta, climber rouleur. Valerio Conti: 22 years old, Italy, 1 cap in the Tour de France, climber. Tsgabu Grmay Gebremaryam: 23 years old, Ethiopia, first appearance the Vuelta, climber. Ilia Koshevoy: 24 years old, Belarus, first appearance the Vuelta, climber rouleur. 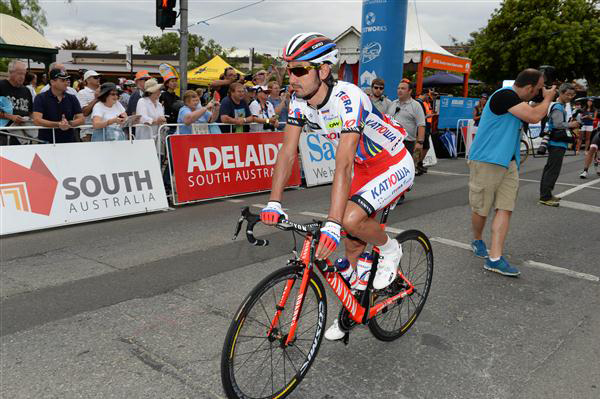 Przemyslaw Niemiec: 35 years old, Poland, 4 caps in the Vuelta, 1 stage victory in the Vuelta, climber. Nelson Oliveira: 26 years old, Portugal, 1 cap in the Vuelta, rouleur. Ruben Plaza Molina: 35 years old, Spain, 3 caps in the Vuelta, climber rouleur. Maximiliano Richeze: 32 years old, Argentina, 2 caps in the Vuelta, sprinter. The cyclists from Team Lampre-Merida will represent 8 different Nations (Argentina, Belarus, Croatia, Ethiopia, Italy, Poland, Portugal and Spain) and 3 Continents (Africa, Europe and South America). The average age is 27 years. The team will be directed by Orlando Maini and Bruno Vicino. In the operative staff there will be the doctors Michele De Grandi and Matteo Beltemacchi, the masseurs Capelli, Chiodini, Del Gallo, Lima, Napolitano and Redaelli, the mechanics Baron, Bortoluzzo, Coelho and Pengo and the driver Bozzolo. "It will be fundamental for us to have a good attitude in approaching each stage of the Vuelta: our task is to battle each day - sport director Maini explained - Conti, Grmay and Koshevoy are young and full of energies so they'll be good performer in the attacks and Durasek and Cattaneo will be good resources on the more demanding stages. For what concerns the general classification, we had to renounce to Valls, who's facing some health problems, and we'll evaluate the condition of Niemiec, who got involved in the past week in a crash while training: the first mountains stages will be an important test. Oliveira and Plaza are important values for the team, since they demonstrated their qualities in the great tours. Richeze will be our captain for the sprints and he'll try to reach the top result he missed two years ago. The team will be international, with 8 different nations represented: that means we'll have many fans all around the world". Team Giant-Alpecin heads to this year’s third and final Grand Tour of the year following successful campaigns at both the Giro d'Italia and this summer's Tour de France. The main focus for the team will be on day success in the sprint stages. Alongside the sprints the team remains focused on the general development process of its riders. This year’s Vuelta presents opportunities for different riders to battle for stage wins, over a parcours that features nine summit finishes as the Vuelta celebrates its 70th edition. The race once again gets underway with a team time trial before heading straight into the first uphill finish on day two. The first week continues with both sprint and attacking opportunities as well as a mountain top finish on stage seven. John Degenkolb (GER) returns to the race having won the green jersey of points leader in 2014 and will be looking to make the most of the sprint opportunities over the three weeks. Team Giant-Alpecin has a strong line-up to support Degenkolb in this, but one that is versatile enough to challenge across other fronts. Degenkolb will be joined by Tom Dumoulin (NED) who will have an eye on the race's individual time trial on stage 17 as well as the puncheur-style finishes, together with Lawson Craddock (USA) who showed his progress once again at the Tour of Poland by taking third on the toughest stage of the race. "Our main goal is to go for stage success with John, as we targeted at the Tour," explained coach Christian Guiberteau (FRA). "With Koen, Luka, Zico and Tom D. we have a strong lead-out for John. With Lawson we are working towards the longer-term development, and will not target specific GC ambitions but rather we aim to help him learn how to behave as GC rider. "We have shown at the Giro and Tour that we are ready to take any opportunities as they come and on the in-between stages we will look to profit from the breakaway opportunities. In addition we have Tom D. here who will look to target the TT along with the classics style stages."